Superbly balanced pinot noirs; crisp rieslings; rich, heady syrahs: these are only a fraction of the expertly crafted wines being produced in the Pacific Northwest's diverse and distinctive wine countries. Second only to California in production, the Pacific Northwest is the largest wine region in North America, home to more than 1,000 wineries. What was once a young wine-growing area with a reputation for eccentricity is today recognized as a dynamic region producing world-class wines, with a focus on ecologically sound practices. 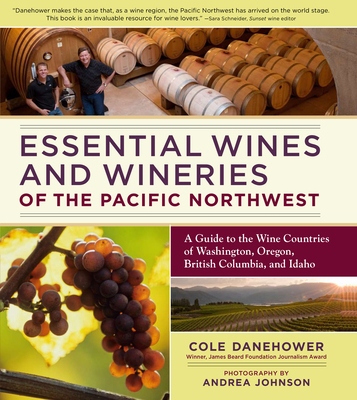 This definitive volume profiles the wines, the people who make them, and the wine countries of Washington, Oregon, British Columbia, and Idaho. The journey begins with the region's climates and geology, which create a fascinating tapestry of wine-growing areas. Next, the book focuses on the unique qualities of each wine region, with profiles of more than 160 representative wineries to visit. Included are legacy wineries that helped to build the region’s reputation, prestige wineries with a national presence, under-the-radar artisan wineries that embody the pioneering spirit of the Northwest, and promising new wineries. Each profile lists the winery's signature, premium, value, and estate wines. Beautifully illustrated with photographs and helpful maps, this in-depth guide is a milestone in the North American literature on wine. It will enable wine lovers everywhere to plan their touring, select their wines, and explore and discover the riches of the Northwest's wine country. Cole Danehower has been a leading regional wine journalist for more than a decade, reporting on the wines, winemakers, and wine countries of the Pacific Northwest. A winner of the prestigious James Beard Foundation Journalism Award, he is also copublisher of Northwest Palate and author of that magazine’s popular “Inside Northwest Wine” column. His wine writing has also appeared in The San Francisco Chronicle, The Oregonian, The Register Guard, and Wines & Vines. A frequent judge for the Dallas Morning News Wine Competition, the Oregon Wine Competition, the Portland Indie Wine Festival, and numerous regional wine competitions, he is also a popular speaker on the region’s wines. Award-winning freelance photographer Andrea Johnson specializes in the imagery of wine, food, travel, and adventure sport. With work appearing regularly in such publications such as National Geographic, Wine Spectator, Sunset, and VIA, she was also co-photographer of the book Passion for Pinot.